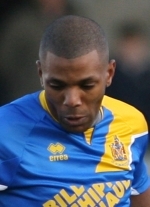 Signed for St Albans City in January 2007 from Ryman League Premier Division side Boreham Wood having scored sixteen times in the first half of the current season. Scored 31 goals during the 2005-06 season with his two seasons at Meadow Park coinciding with the club winning Division One East of the Southern League and reaching the last four of the FA Trophy. Originally made his debut for the Wood back in the 1999-00 season before spending three seasons with fellow Hertfordshire side Cheshunt where he scored 51 times in 92 Isthmian League games. As a youngster he signed Associated Schoolboy forms for Tottenham Hotspur in February 1994 but did not progress beyond the U16s at White Hart Lane.